If you’re a movie buff, you will already be aware of the part that jukeboxes play in movies around the world. Whether it’s in a local diner or café, at a wedding or engagement party, or just in someone’s backyard as they host a big shindig. Jukeboxes are making a comeback in party culture and they go a long way to creating an atmosphere worth staying for. I think one of the key things the jukebox added was the ability for anyone to contribute to the atmosphere. You didn’t have to be incredibly technologically able, nor did you have to be a music expert because you knew that any music on the jukebox was already a hit! So that’s what I think, but where did the whole concept come from? The first form of the now Jukebox was “music boxes and “player pianos”. A coin operation musical device, these gave people the first taste of controlling their music. In 1980’s the first machine was developed – using actual recordings instead of physical instruments. At the beginning of the 1940’s, popularity grew in America and the term “jukebox” was coined. It is said to have come from the familiar usage of “juke joint”, derived from the Gullah word “juke”, meaning disorderly, rowdy or wicked – well that certainly sets the tone for parties! Jukeboxes were most popular from the 1940’s through to the 1960’s with three quarters of all music produced in the US being made available. The Kinks even recorded a song called “Jukebox Music” as a statement to its growing popularity. Once a major source of income for record publishers, the invention of the transistor radio saw access to free mass music made available to all. So, like all good things, the jukebox’s place in diners, restaurants and bars slowly started to come to an end…or did it? Much like an old car resurrects as a “classic” – jukeboxes have found a new place. The record player has come back in the 21st century because people want to experience the charm and delight of a two-way relationship with music; we all lead busy lives and sometimes we need a way to unwind. Much like the record player, a jukebox allows you to enter a relationship with music. It is a party piece to be shared with few, many or all and it will rejuvenate your events to allow you to create a space where your guests can be involved with that relationship as they all come together. 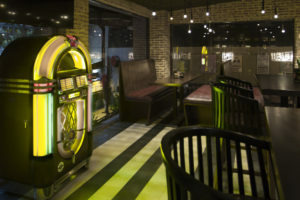 From humble beginnings as a decorative and functional addition to diners across the US, the jukebox is returning to locations across Perth, including your home. Have a think about what would create a better party atmosphere – your iPhone or a jukebox. Once you have come to your conclusion, we’d love to hear from you.